Scottie Wilson, probably one of the better known Outsider Artists grew up in Glasgow before moving to Canada to set up a second hand store in Toronto. 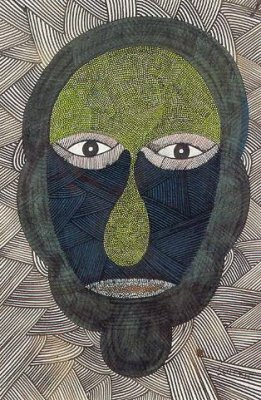 Wilson’s works are iconic within Outsider Art; and his unique cross hatching technique instantly makes them recognisable as Wilson’s. The work is usually centred around a face; which he called ‘Greedies’, which is surrounded by natural forms such as flowers or birds. His work is predominantly very bright, with clashing colours and thick black lines.His earlier work is much freer in terms of line, with his later work becoming more visible controlled with tighter, more intricate line detail. Wilson claims he felt compelled to paint after discovering a fountain pen in his store. He claimed he felt the urge to draw, or doodle, and never stopped since that day. Despite being considered an Outsider Artist due to his lack of formal training, Wilson became accepted into the Surrealist art scene on his return to London in the 1950s. His work was collected by Andre Breton and Picasso amongst many others. Often disinclined to part with his drawings, Wilson would curate exhibitions of his work on buses or in disused shop windows and would charge visitors to view his pieces.